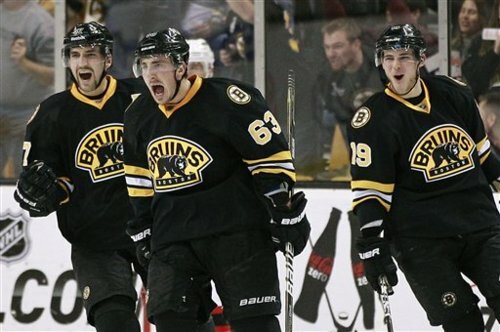 The Bruins will resume their season tonight and look to get back on track against the Ottawa Senators at the T.D. Garden. The B’s lost their final game before the All-Star break to the Capitals and have been inconsistent over the second half of January. I am confident the team can refocus and return to their winning ways of November and December. It all starts with strong play in the net, where Tuukka Rask is expected to start tonight after Tim Thomas had a busy weekend in Ottawa at the All-Star game. Nathan Horton will be out of the lineup tonight as he continues to battle concussion symptoms. Remember to come join us tomorrow at the Brad Marchand signing event!! February 1st from 3-5pm at Upper Crust on the BU Campus at 888 Comm Ave, right across from the Agganis Arena. Indy is all about the “Fan First” mentality this year while they are hosting the Super Bowl. Last year, when Dallas hosted, there were over 1200 seats that were said to be “unsafe” causing many Steelers and Packers fans to stand to watch the game. Obviously, many fans wanted r eimbursement from both the Cowboys and the NFL in general. This year, they are trying to avoid that. Indianapolis is primarily a pretty friendly place, as I am told. Not to mention it snowed, and since they weren’t ready for it, it made it very difficult to travel to and from events around the Texas area. At least in Indy, if it does snow most bars, hotels, and events are within walking distance. So far, Indy is doing everything the right way. They even brought in people that work for Disney cruise lines and events to show the workers at Lucas Oil Stadium how to maximize the visitors’ experience. So, assuming that the Pats can hold on and crush the Giants, it should be a pretty great weekend for all of those who attend. Since its been a couple of boring days for the Red Sox, I decided to write about the X Games over the weekend. Some of the events I was really disappointed by, but there were two things that I was glad I got to see. Sunday in the day was a snowmobile jumping competition. 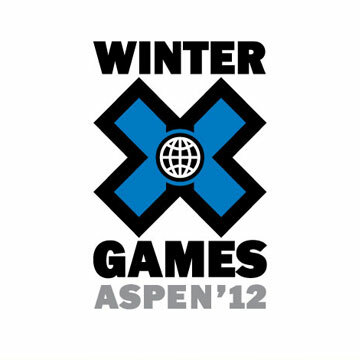 The very first guy I watched (Heath Frisby) did a front flip on his snowmobile. My friends and I were in awe of how cool it was, but also how psychotic the guys must be. Then the announcers said it was the first front flip ever landed and about twenty guys celebrated for the next minute and a half. I thought it was cool and all, but not warranting all that celebration. Sunday night was where I was really interested. Every year I make a point to watch the superpipe competition and see if anyone can push Shaun White off the gold spot in the podium. Run after run guys tried to outdo Shaun, which made the event that much better. Guys push their limits and you get to see great tricks, but the majority couldn’t complete their run without wiping out or messing up somehow…except for the flying tomato. Guy is a straight baller. Skinny pants might be a bit soft, but he always put on a show in that event and does it flawless. What I liked most was his victory lap, his last run in which he was already guaranteed gold. Instead of taking it easy (with his hurt ankle) and taking a joy ride for the fans down the pipe, Shaun pushed himself to the perfect run, getting incredible air on every jump. He was awarded the first perfect score (100) in X Games history. Think back to November 2011, when things seemed like they couldn’t get any worse for the Sox as rumors of Heidi Watney departing started here on the Boston Sports Blog (Heidi, Say It Aint So!). She even tried covering it up on vacation (Don’t Kill the Messenger). And we all know how that played out. I mean the Lakers? Really? Anyways, since her final days in Boston the buzz about finding her replacement has been pretty quiet until recently. Last night NESN confirmed that former ESPN anchor Jenny Dell will take Heidi’s place as Red Sox in-game reporter. More known for her insight on football, it will be interesting to see Jenny take on a full time baseball role. Either way, the Sox need all the momentum they can get heading into spring training after the disaster that was last September. Hopefully filling the hot side line reporter gap will be just the edge they need. Red Sox Nation, enjoy. 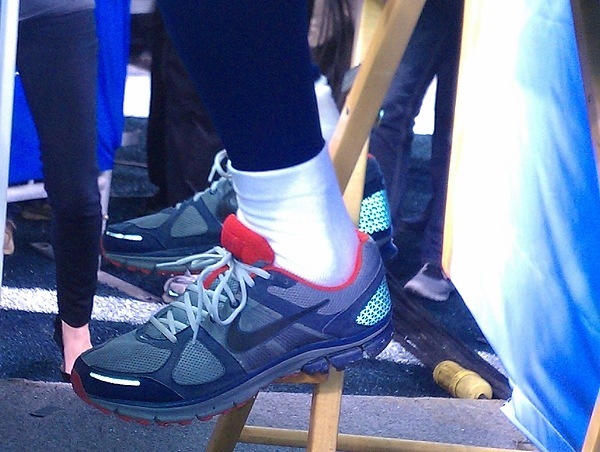 Patriots Tight End Rob Gronkowski showed up for media day at Lucas Oil Stadium in Indianapolis today minus one thing he’s had all week: His Walking Boot. He knows having Gronk out there gives them a much better chance to win Sunday. The guy is an absolute freak. He possesses the combination of size, speed and just pure talent that hasn’t been seen from the Tight End position since Tony Gonzalez back in the early 2000’s. The Pat’s will more than likely hold Gronk out of practice for the rest of the week until the team walk-through Saturday. Whatever needs to be done to get this monster on the field Sunday will be done. Maybe Belichick should call up Bibi Jones to have her help heal Gronk. The Giants offensive line is very solid. They don’t possess too much of a running game and I’m sure that’s not the main focus of the Patriots defense. The Giants only allowed 28 sacks against this season. If the Giants O-Line can give Eli enough time to find his open receivers against the Patriots shaky secondary then they should be able to put some points on the board. Eli has great pocket presence and does well escaping the would-be tacklers in the backfield. (Note 2007 Tyree Catch). God I hate talking about that but when you think Eli escaping a tackle it instantly comes to mind. The Giants are solid in the middle with David Diehl and Chris Snee at the guard positions. If the tackles for the Giants O-Line can keep Anderson and Ninovich out of the backfield Eli should be all right. The Patriots have one of the most talented offensive lines in all of football. Although Brady was sacked 4 more times than Eli I still have the utmost confidence in this O-Line. Obviously this is a brutal matchup for them but if they can play up to task I don’t see the Giants pulling this one out. Both Guards made the Pro-Bowl; Matt Light isn’t to bad either. 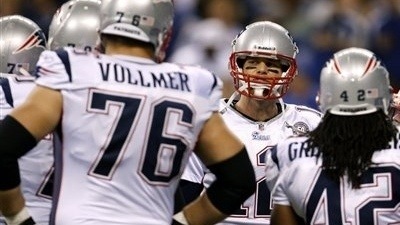 If Sebastian Vollmer is healthy enough to play I expect him to get more time out their than Rookie Nate Solder. Similar to the Giants, the Patriots run-game isn’t exactly something to be to scared about, but I think it is key that the Patriots use the run game to keep the QB hungry Giants D-Line on their toes. Like I’ve said before; this game will be won or lost in the trenches. I’m not saying the Patriots will be able to protect Brady as much as the Giants can protect Eli but that’s because of the immense talent on the Giants D-Line. Strictly talent wise; the Pat’s have the edge. What is the point of Spring? (Assuming that spring starts after the Super Bowl on Sunday) And for those of you that say pre-season baseball, just stop. Can’t think of anything? Exactly. After football season, there is nothing good to watch until the Stanley Cup and NBA playoffs in June. Sure, Baseball starts in April, but it’s a long season. 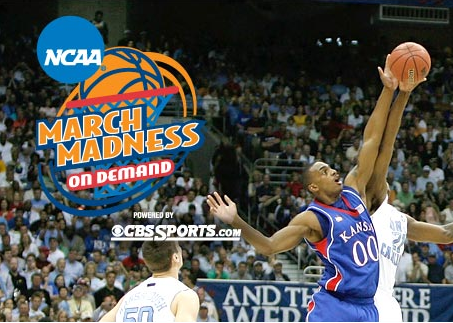 There have been multiple articles about how College Basketball could easily fill that void. No one pays attention to college basketball until after the Super Bowl anyways. What if their season were to start around New Years and continue throughout the spring, with March Madness turning into May Madness. Of course there will be people that hate change (just like the BCS system) but it really does make sense. All of those students will not have to leave class for a month when their teams make it all the way. The semester will be over and they can focus purely on basketball. Also, they will only have to take one semester of light workloads, rather than both fall and spring. I agree. I was in San Diego last year during San Diego States run in the tourney (before they lost to UConn), and it was electric. My friend and I were the only ones rooting for UConn and even then, we were scared to show it at times. However, when you’re at Hooters with a bunch of guys from the Navy, it’s hard to focus on anything but the obvious (drinks, babes, and wings). College television ratings would sky rocket because there is nothing else to watch, everyone would be able to go out to bars and watch all the games because we would be out of school, rather than using our smartphones to get up-to-date scores, and we would have something to be excited about when we’re awaiting the Bruins to win the Stanley Cup and the Celtics to die off. What do you think? This is just brutal in every sense of the word. Sorry Perk. 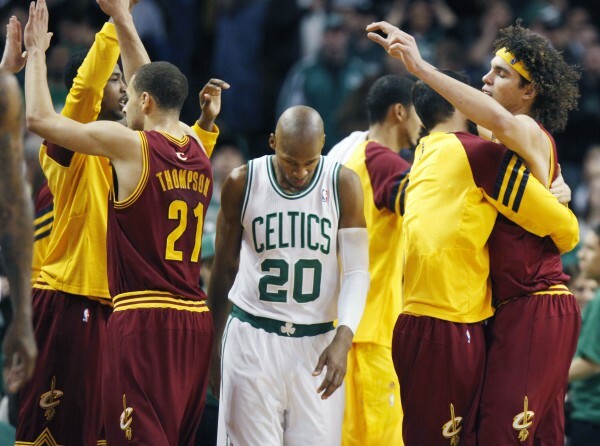 At this point, most people have written off the Celtics. “They’re just too old.” Well I still have faith that not all will be lost this season. There’s still time to turn it around. Regardless, last night’s game was one of the more aggravating C’s games this year. I’m not saying this because they lost to the Cavs, although that hurts too, but because we had the win in the palm of our hands. Up 11 points in the 4th quarter, the Celts let Cleveland go on a 12-0 run to finish off the game and win 88-87 with two seconds left. One single basket would have made the difference. We just can’t score, even against teams like the Cavs who let up close to 100 points a game. Again, our defense is solid. We’re pressuring teams and not letting up easy buckets. Avery Bradley has stepped up big time in Rondo’s absence, constantly down opponents’ throats on defense. The C’s just need to find their rhythm offensively. It’s there, somewhere in the mix of great basketball players in the Celtics lineup. The true test will be how they bounce back against the same Cavs team tomorrow night. After all, they have been hot as of late, winning four straight before losing last night. The Giants Tom Coughlin often finds himself on the hot seat during the regular season, but somehow manages to turn it all around late in the season and heads into the playoffs on a solid note. Coughlin is a good coach with a lot of experience but he is often questioned about being able to have control of an NFL team at his age. He has as much experience as almost any coach in the NFL as far as years in the league, but when it comes to winning it all, his stats are just average. Coughlin is a solid coach but seeing as who he is going up against, I’m sure you know where this is going. 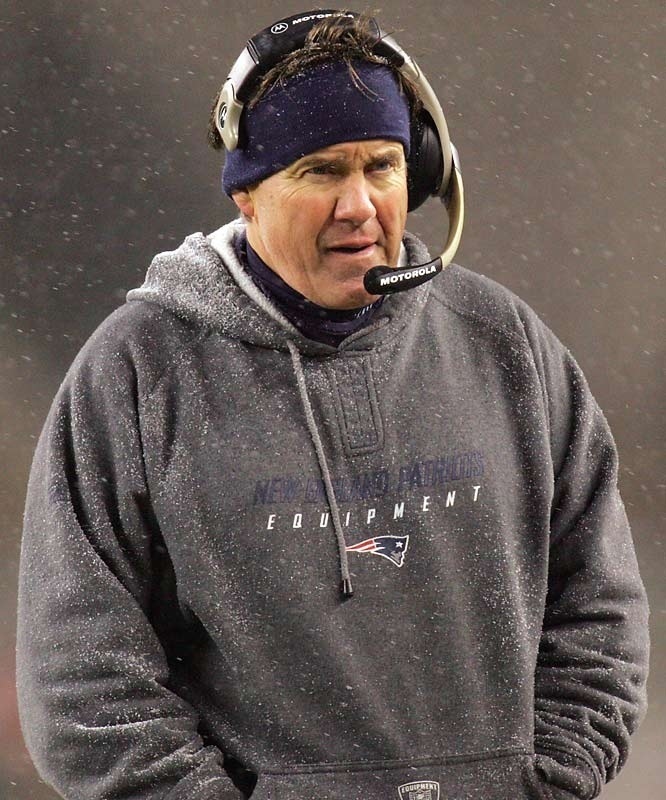 Bill Belichick can go down as one of, if not the greatest coach in NFL history with a win this upcoming Sunday. As a head coach this will be Belichick’s fifth super bowl appearance since taking over as the Patriots head coach just over a decade ago. Bill is 3-1 career in the Super Bowl. Belichick is one of the best in history when it comes to making something out of nothing. The defense had terrible numbers as far as yards against this season, and that’s what everyone’s focus has been on. I could be wrong , but I’m pretty sure yards against isn’t what wins or loses a game, points do. The Patriots ranked 15th in points against; allowing 21.4 ppg. With a secondary as inexperienced as what they have, Belichick has done a great job with it. The Patriots bend but don’t break style has allowed them to be where they are today.